Donald Trump may have carried Texas and clinched the White House in November, but support for the Republican presidential nominee waned in parts of the Dallas area — news that, in a typical election year, could spell trouble for some Republican-held congressional seats. The drop in Dallas-area Republican support doesn’t necessarily indicate voters are moving away from the GOP, several experts say; rather, that many voters moved away from the controversial candidate. The drop in support this year could be from “an artificial high … to an artificial low created by the presence of a presidential candidate who alienated a subset of otherwise reliable GOP voters,” he said. Or, you know, it could simply be that a lot of Republicans voted for Hillary Clinton in Texas. This is why I’ve been emphasizing the judicial races as a more accurate way of measuring partisan support in a given area, and for making comparisons to 2012. I don’t have that data for the Dallas-area districts at this time, but as we know from Harris County, CD07 still looks pretty red when viewed through that lens. I’d say Culberson has a little bit to worry about between now and the next round of redistricting in 2021, when I fully expect more of CD07 will be shifted to the west and north, but barring anything unusual and bearing in mind that no one has any idea what the short term political effects of the Trump regime will be, I’d bet Culberson will still be there. There’s an image in the DMN story from this tweet by Miles Coleman, which in turn points to this story he wrote about the larger Houston metro area. Basically, it’s a color map of precincts in Harris, Fort Bend, and Montgomery County, all based on the Presidential race. 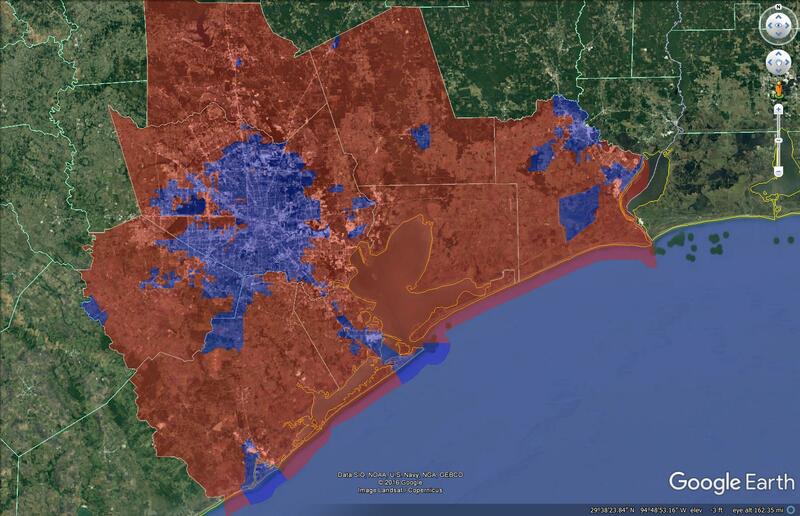 That’s a lot of blue in Harris County, and while it’s concentrated in the center of the county, it’s spread out quite a bit, with a significant incursion into Fort Bend. I’d have liked to have seen Galveston and Brazoria included in this map as well, but what we have is still useful. As is the case with Pete Sessions’ CD32, which pokes into Collin County, there are a lot of districts that cross county borders, and that’s something we need to think about more. That’s for another day. For now, even with the proviso that there’s a lot of crossover votes in the blue of that map, take a look and ponder the potential. I love seeing the blue creep into northern Brazoria County!!!! Go Dems!